“We’re at peak multigenerational” housing? In 2014, more young people were living with their parents than with a romantic partner. And a lot of these millennials’ parents were cohabiting with their own parents. 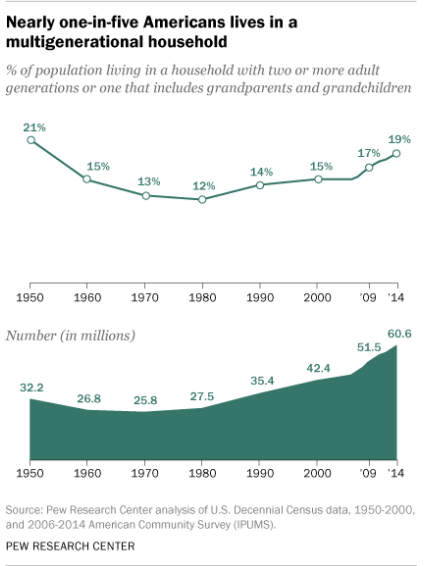 A new Pew Research Center analysis finds that a record-high number of Americans—60.6 million, to be exact—were living with with grandma and grandpa that year. In terms of share of the U.S. population, these people made up 19 percent in 2014. That’s almost as high as back in 1950, when 21 percent of the population, or 32 million people, lived in such an arrangement. Money—or lack thereof—helps explain why this housing arrangement is back in style. The economic woes of the late-2000s brought millions of young adults boomeranging back to their childhood homes. But the trend also has to do with immigration and diversification of the U.S. population. If indeed money is a motivating factor, we might expect these numbers to drop when the economy improves or when younger adults do better in the job market and move out of such arrangements. Or, does this uptick herald a long-term interest in living in multigenerational settings regardless of financial imperatives? As noted later in the article, whites are the least likely (15%) to live in such settings. Will such differences persist in the future or will such arrangements decline in non-white groups as (1) their financial prospects increase and (2) more recent immigrants spend more time in the United States? Stay tuned for another peak that may not be one. This entry was posted in Sociology and tagged grandparents, multigenerational housing, peak, Pew, trends. Bookmark the permalink.